Don’t get it twisted: The Tributes in The Hunger Games are dressed for survival, not for fashion. We’re the exact opposite: The most danger we’re faced with every day is whether or not our lattes will burn our tongues. Still, we love the whole fashion aesthetic of Katniss Everdeen and the rest of the Tributes. Want to dress like you’re in the Capitol? Check out our fashion picks. Katniss, Peeta and the 22 other Tributes all wear the same tracksuit during preparation for the 74th Hunger Games. Glimpses of the tracksuits in movie stills show that they’re pretty typical athletic gear — semi-fitted with moisture-wicking fabric. We’ll be honest: These suits aren’t exactly what we envisioned back when we devoured the trilogy. If we had to choose the Tribute training gear, we would have chosen a fitted HeatGear short sleeve T-shirt from Under Armour ($30) with some EVO Coldgear pants ($60). Finish off the look with some black SeeVees combat boots for $79 and you’re ready to take on athletics worthy of The Hunger Games. All bets are off when the 24 Tributes get into the Arena to fight — literally — for their lives. They must be ready for anything the Capitol dishes out to them, including extreme heat, cold, water, wind — and everything in between. For that reason, the Tributes must be decked out in all-terrain gear — think fabrics that have ample storage space and can withstand a beating. For starters, a women’s utility jacket from Duluth Trading ($50) has plenty of pockets for storage while still keeping a feminine shape. Cargo pants are always the best option for outdoor wear as they stand up well to all types of weather. Check out these linen blend cargo pants from Old Navy ($30) — they are stylish enough for fashion-loving women and are loose enough for quick escapes away from other Tributes. You can’t forget about accessories either: A strong pair of combat boots — like these from Volatile ($53) — give off a “don’t mess with me vibe” and keep toes warm during those cold nights outdoors. Finally, a strong canvas backpack — like this military-inspired one ($30) — has plenty of room for those Arena essentials and gifts from sponsors. 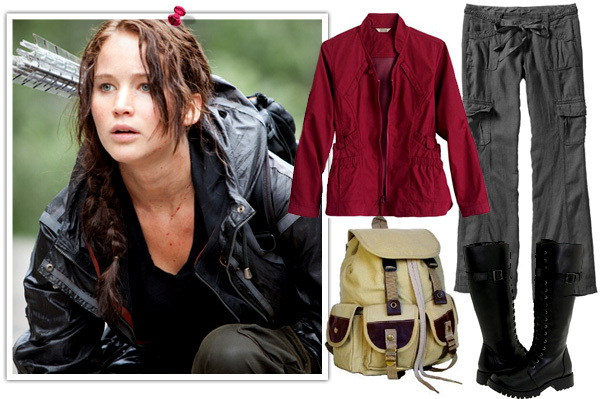 What styles would you wear inside The Hunger Games Arena?